The basic argument is that the Pope has committed 'crimes against humanity' and should be prosecuted. Some don't see it that way, of course, and the thoughtful reader may decide for himself. Some will be outraged that this should even be suggested, but it is a part of the story. Is it a desire of the disaffected left-wing media to disgrace a holy man? I find it ironic that a man who claims immunity from prosecution by the world’s governments for crimes against children also claims the right to lecture those same governments on how poorly they govern (e.g.,“Caritas in Veritate”). The world's governments have no obligation to honor the sovereignty of a Vatican phoney state. Benedict was called by God to be Bishop of Rome, to preach, and to administer the sacraments, not to be the ruler of a phoney state. “Therefore the power of the Church and the civil power must not be confounded. The power of the Church has its own commission to teach the Gospel and to administer the Sacraments. Let it not break into the office of another; let it not transfer the kingdoms of this world; let it not abrogate the laws of civil rulers; let it not abolish lawful obedience; let it not interfere with judgments concerning civil ordinances or contracts; let it not prescribe laws to civil rulers concerning the form of the Commonwealth.” Augsburg Confession, Art. XXVIII. “The Roman Pontiff claims for himself [in the first place] that by divine right he is [supreme] above all bishops and pastors [in all Christendom]. These three articles we hold to be false, godless, tyrannical, and [quite] pernicious to the Church.” A Treatise on the Power and Primacy of the Pope. Thank you for your comment. See the following post with a link to the current issue of The New Yorker magazine. Hendrik Hertzberg connects Martin Luther's legacy with that of the current RC church crisis. Yes, Hertzberg does connect the Martin Luther legacy with the current RC church crisis but only superficially: Papal indulgences for sin with papal indulgence of child abuse. However, Hertzberg is wrong about the crisis not being about doctrine. The crisis is all about doctrine. The Martin Luther legacy identifies the root cause of RC church crises as the Pope's rebellion against the doctrine and authority of the gospel (Smalcald Articles, Part II, Art. IV). Paul says "Let every soul be subject unto higher powers." But the Papal Confutation of the Augsburg Confession, Art. XXVIII, denies that the Pope and his priests are actually subject to the higher powers of government: "Although many things are introduced here in the topic of Ecclesiastical Power, with greater bitterness than is just, yet it must be declared that to most reverend bishops and priests, and to the entire clergy, all ecclesiastical power is freely conceded that belongs to them by law or custom. Besides, it is proper to preserve for them all immunities, privileges, preferments and prerogatives granted them by Roman emperors and kings. Nor can those things that have been granted ecclesiastics by imperial munificence or gift be allowed to be infringed by any princes or any other subject of the Roman Empire." 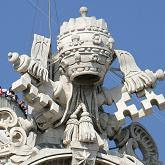 The Pope is now willing to accede to the authority of government except for his own personal immunity and within the confines of his phoney realm.